Custom Tags – Statcounter Blog. Custom Tags is a new way to measure traffic with StatCounter. It lets you tag pageviews on your website with whatever data you wish, allowing you to filter and segment your traffic in StatCounter reports in completely customised ways. This can lead to measurement and insights not previously possible with StatCounter. Answering these questions could help you optimise your content to attract more traffic. With the example code above you would be able to see which type of blog format attracts more traffic, and use that insight to help optimise blog posts in the future. 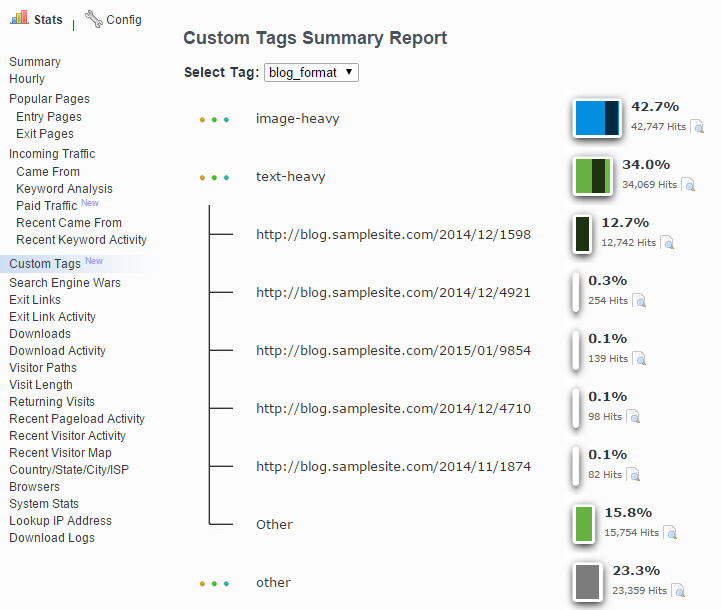 You can also click on a tag value in this report to to see which of your urls perform best for that tag. You can also filter many of our existing reports for these tag values. Remember, the above are just sample ideas – you can tag your pageviews with any data that is useful to you. We will be developing this feature further and adding new features to help you measure more with StatCounter. We’d love to hear your feedback on what you want to measure and how we can help make this happen with StatCounter. I was waiting some time now for this feature. Thanks! Hey there, i’ve got a question. Can I use StatCounter WordPress plugin you have but yet put custom tag code such as keeping track of various activities in addition to some of the pages content? Or maybe I can’t put any new code if the plugin is turned on? My “new” statcounter opens all mixed up. Just by chance I can get the former overview over my projects. What’s wrong ? Nice feature. Glad you are always updating. This feature is great! Thank you. I have a blog and it is very useful for me. This information is very nice. I really appreciate you a lot of work to create . This looks like an interesting new feature i will have check it out and set up one of my sites to see how it goes.